“I think the doorman is just as important as the guy who owns the building,” real estate broker Luis D. Ruiz says in an episode of Bravo’s Million Dollar Listing, New York (MDLNY). “Because you never know where a deal is going to come from.” (Watch a trailer for the show here.) Ruiz is one of three New York real estate brokers – and reality TV personalities – who make up the cast of the popular and fascinating show that will next air its 6th season. 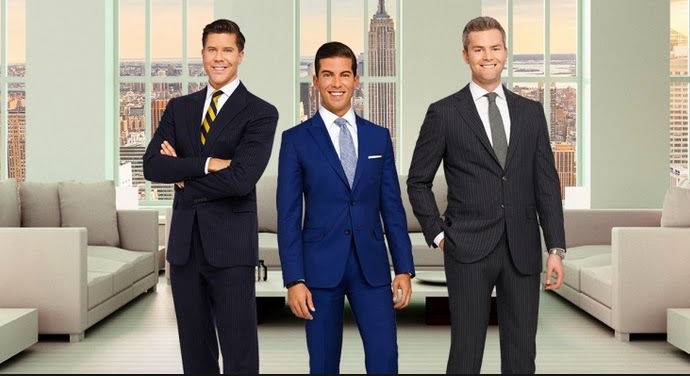 Ruiz, in many ways, is the show’s “conscience.” Yes, he’s as money hungry as the other two brokers on the show (Frederik Ekland and Ryan Serhant), but he is cast as the more humble of the three, the young immigrant from Puerto Rico who has worked his way up. He raps. He cries. He flashes a winning smile. Ruiz’s comment about the doorman is about as far as the show ever comes to expressing interest in “average” New Yorkers, those getting pushed out, forced out, and priced out as the city is sold, slicked, packaged, promoted, hyper-gentrified, spiffed up, “sexed up,” and marketed. Now, buildings are given catchy monikers to entice buyers. “Starchitects” are deployed to help elevate already astronomical prices. Addresses of available property appear on women’s bodies. Multi-million dollar renovated apartments are staged with tactics including making short films, which offer an imagined lifestyle of a would-be buyer, throwing lavish open houses for brokers, and showing off the various crazy features of the “new” New York’s high priced real estate (such as a “sky garage” en suite). 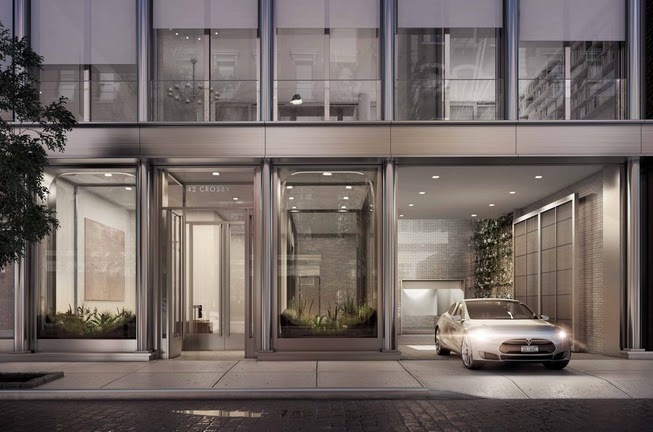 Rendering of a 2014 SoHo Development: Want the garage? Add $1 million to the price. MDLNY premiered in March 2012 as a spin-off of the show, Million Dollar Listing, Los Angeles. Ruiz, the third broker on the show, was originally “played” by erstwhile cast member, Michael Lorber, whose father, Howard Lorber, is co-owner of Douglas Elliman, a real estate firm featured on the show. As a cast member, Michael Lorber was bullied and insulted by the other cast members. Now, Ruiz takes on that role. (See a particularly disturbing moment here). 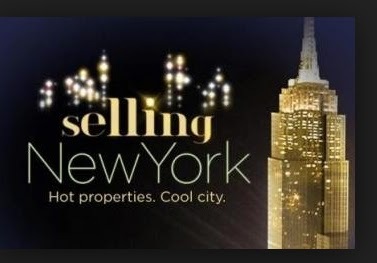 Two years before MLDNY’s premiere, its predecessor made its debut on HGTV with the apt title, Selling New York. Food Chain NYC: Who’s on the Bottom? “They are assertive, razor-sharp and always compelling real estate brokers in the country’s most competitive market. In a city of over 8 million people, where the average sale price is over $2 million, the competition to seal the deal is stiff. 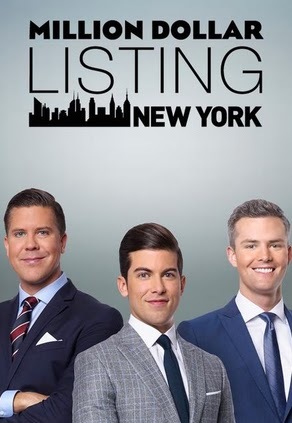 Now, catch a rare glimpse into a world where a solid reputation at the top of the real estate food chain involves swimming with the sharks, going head-to-head with the best, and rubbing shoulders with the wealthiest and trendiest of New York’s social, political and artistic elite. 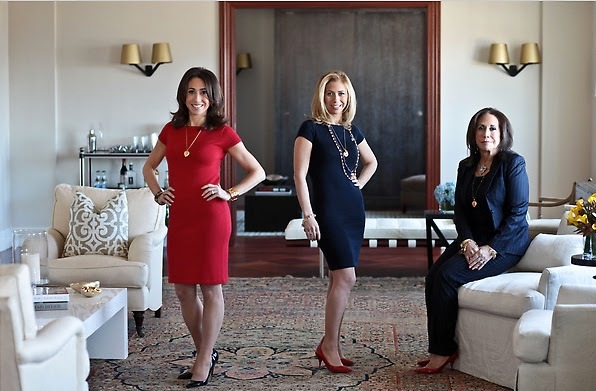 On Selling New York, various brokers are featured, but the stars are the Kleier women, two daughters, Samantha and Sabrina, and their mother, Michele, a high powered, well known broker and owner of her own real estate firm. The women chit chat and make deals, sit around their kitchen table and talk, and trot around in their high heels, their expensive purses held out before them as if they were blocking some kind of evil force. The New York Times called the Kleier women the city’s “real brokers” when the show premiered in 2010. Both Selling New York and Million Dollar Listing New York came on the scene in the aftermath of the 2006-2007 real estate crash and at the onset of the Great Recession. In 2006, the foreclosure rate in New York City was 5.8 per 1,000 households. After the housing bubble burst in 2007, that number started to climb. By 2010, the rate reached 22.2. (For more detail see “Foreclosures in New York City,” Report of Thomas D. Napoli, New York Comptroller, 2011). 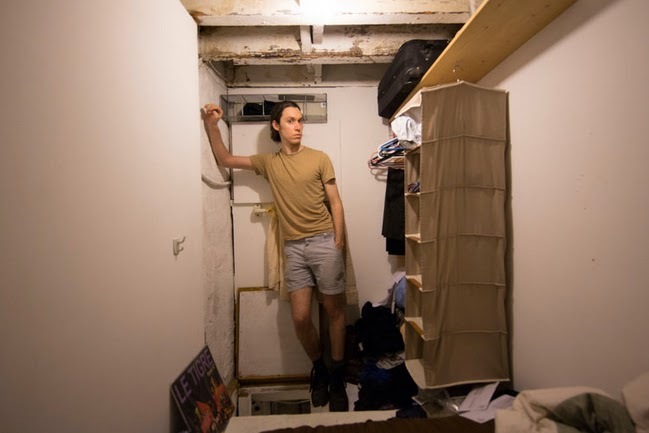 While the average New Yorker found life hard in the wake of the economic calamity, there were plenty of people with cash to move in to the city, buy up foreclosed properties, and later look for “under market” priced buildings to buy (and then force/evict/push tenants out.) 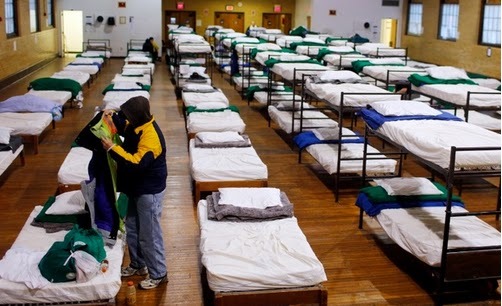 The result: affordable housing in NYC began to dwindle. Fast. Show Me the Mortgage! 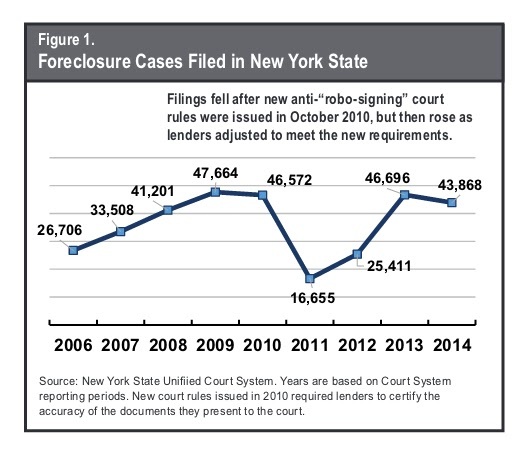 Foreclosure rates momentarily dip after courts order banks to legitimate ownership of properties. Home Sweet Home: a 78 sf “Micro” in Hell’s Kitchen. Get a tour here. Podcast for People: For more on the housing crisis take a listen to There Goes the Neighborhood, a 2016 podcast produced by The Nation and WNYC that takes an “in-depth look at gentrification” in Brooklyn. So how is it, in the midst of so many people losing their homes, that NYC real estate prices would break record after record following the crash? The “tanking” of the NYC real estate market, along with the rest of the economy, was only slightly “portrayed” on TV shows that focused on the lives of brokers and flippers and the art of real estate deal making. Notably, in another reality show set on another coast, Jeff Lewis and his team were shown suffering the slings and arrows of a market in decline on Bravo’s Flipping Out. The erstwhile house flipper was forced into (oh, dear) renovating other people’s homes (!) to make a living post crash. But the other shows, Selling New York and MDLNY, focused on the big money in a new market of the SUPERRICH. These shows now constituted a new version of “Lifestyles of the Rich and Famous” and they unwittingly documented the selling off of New York City. Just a little pied a terre: 165 Perry St.
Oh, yes, New York! Luxury. Escape. Impeccable. One-of-a-Kind. Hand-Crafted. Wraparound Views. Carrera Marble. Ebonized Floors. En-Suite Post Suite Tout Suite. Dateline NY: After the crash, New York City underwent an invasion: “great torrents of cash came pouring into Manhattan,” as Daniel Gross of New York Magazine wrote in 2015. These torrents belonged to the “superrich,” once a rarity in New York, as everywhere else. “The Forbes 400,” Gross reported, “which tallies the domiciles of Americans worth more than $750 million,” recently listed 38 of those 400 as living in New York City. See more here and more about the “shelter industrial complex” here. Masterful design and modern luxury are uniquely embodied in this 4 bedroom 4.5 bath Duplex Penthouse with a 4500 SF wraparound terrace . . 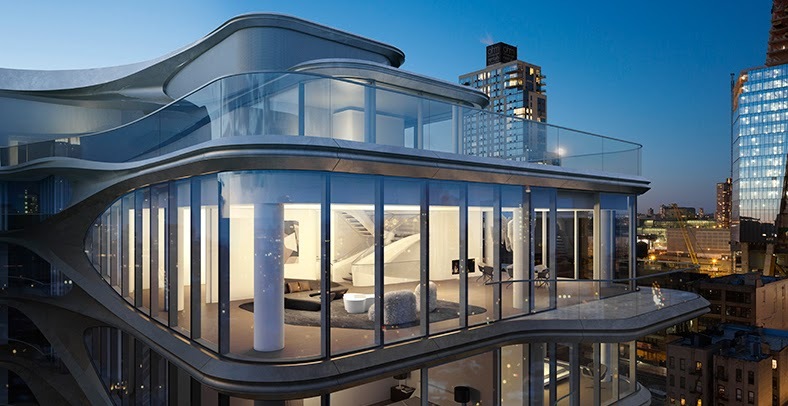 This one-of-a-kind glass house, created by New York architect James Carpenter who designed 7 World Trade Center, is sheathed in high-performance, museum-quality insulated glass atop an historic Art Deco loft building in the heart of Tribeca. . . .Every detail was carefully selected and quality crafted. Highlights include Lutron light and shade systems, heated bathroom floors, concrete first-level and hallway floors, teak wood bedroom flooring, troweled plaster walls and ceilings, artwork display lighting, hidden mechanicals, a climate-control system, high-tech security system, and spacious corner rooms that overlook the city. . . .The top-of-the-line chef’s kitchen is clad with premium finishes and fixtures including custom white lacquer cabinets, bluestone counters and professional-grade appliances. Sliding glass doors in the dining area showcase views while opening up the home to even more light and air. Spill out to the awe-inspiring terrace which can be accessed from any room, where a fully-equipped outdoor stainless steel kitchen, sun deck, hot tub and private outdoor shower await. NYC Command Center: Hey! Even NASA doesn’t pay so much for a couple of screens: Price $40 Million. 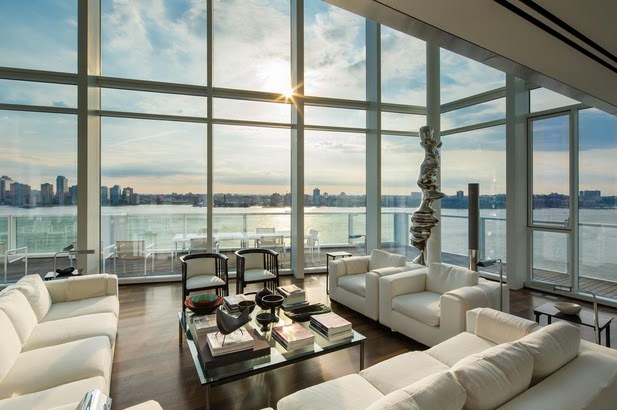 By the Numbers: Take a look at Curbed NY’s map of the most expensive real estate sales of 2015 here. Part of the reporting on the sky-high real estate industry focuses on the record-breaking prices paid. 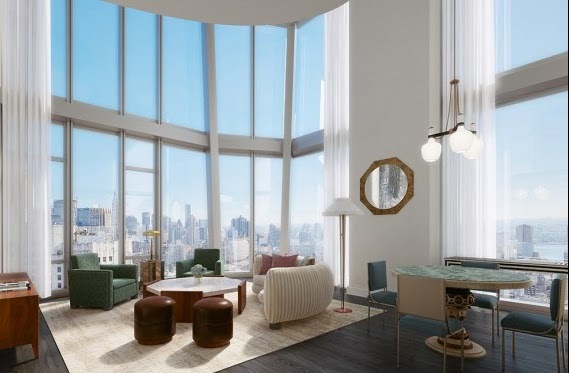 In 2015, a 14,000 square feet duplex apartment on the 75th floor of the ridiculous “luxury building,” One57, at 157 West 57th Street, was sold for more than $91 million. The buyer was hedge fund billionaire Bill Ackerman, who seems to live in a world of absences. He didn’t get rich making anything, and he didn’t buy the property to be occupied. No, his seems to be a pure kind of world, where a simple desire for more reigns supreme. He bought the place apparently to flip and make more money. And yet, even he did not pay the highest price at One57; the highest price on record is $100.5 million. 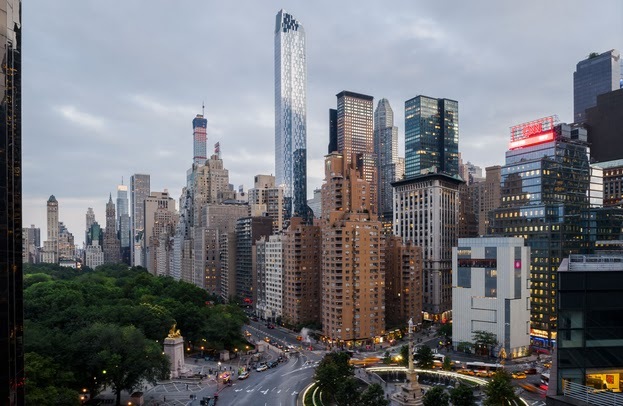 Towering Over Everyone: One57 is “branded” as a building for billionaires. 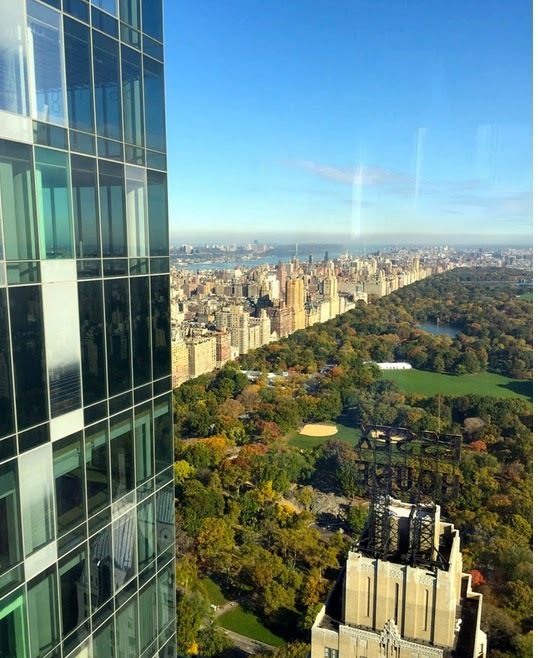 Like other luxury buildings, One57 is advertised as “rising above it all.” That building, along with many of the new designer buildings, features an exterior surface that reflects light and the city back onto itself, acting as a kind of visual barrier to those on the outside. Indeed, and ironically, the appeal to the billionaire buyer is that s/he can buy a place that is somehow not even a part of the city at all. Oh, sure, you can see it from your “wraparound” windows. But you are “set apart” from its reality. You are “enclosed;” you dwell in an “ultimate retreat;” you exist, in fact, in a bubble. (uh-oh). Local color? An open book provides the only hint of human life. A room in Real Housewife of New York Bethany Frankel’s subdued, muted “Living Space:” She listed her $6.95 million Tribeca apartment with, who else? her Bravo pal, Frederick Ekland of MDLNY. In staging these multi-million dollar residences, the idea of absence is reinforced. Carefully staged images must only “hint” at any real life in the living space. Have a seat, or 20. Meatpacking (District) never looked so elegant. Price: $31 Million. The selling off of New York is nearly complete. Who owns it now, you ask? Well, wealthy people from all over the world. People looking to park their financial power in properties that have been so worked over that they resemble a page out of a catalogue, a marketing piece, something created by those whose lives center on the act of selling. Some people, such as the above mentioned Gross defend these 1%-ers since they support an economy and employ people (ahem). But in fact, what makes a city great is not that you have a class of superrich to give you a $10 an hour job. What makes a great city is not that you “get to” walk through a park that has been spiffed up by generous benefactors. What makes a great city is not that old “eyesore” buildings have been graciously demolished and replaced with new eyesores (eg One57). No, what makes a great city is Community. Energy. Equality. Safety. Opportunity. Humanity. (for all). New York, New York. A global hub. Of Money. Many thousands of residents are gone. The “color of the great city,” to use Theodore Dreiser’s phrase referring to New York, has turned into a muted palette of the very same “neutral,” “subdued,” beige and earth tones so widely used in the expensive design of interior living spaces; that palette seems symbolic of a city drained of its former colorful life. In the aftermath of the crash and the selling off of New York, greed can be seen to have indeed altered the city’s landscape. As a result of the luxury boom, there is now “a high-end condo glut.” So-called “aspirational” pricing of high-end units is not bringing in the sales as in the last few years. Even MDLNY’s Frederik Ekland has to play a new kind of game in a city that is bloated by the years of high-priced condos and new development targeted to the wealthy, elite buyer. As of October 3, 2016, Manhattan apartment sales had reportedly “plunged” 20%.